If you have been waiting to see some statistics on how our winter of 2011-2012 rated compared to climate history, or if you were hoping for a long range forecast (educated guess) for the summer of 2012, stay tuned, I am working on both. I’ve been preoccupied with getting the 2013 Alaska Weather Calendar printed and out to stores. That rush is easing and I hope to increase the blogging frequency at least to where it was before. If you would like an automatic email when a new article is posted, sign up for that service under “Subscribe to Posts” either on the menu items across the top of the page or on the right hand sidebar items. In the Arctic, no one expects anything like spring weather for some time to come. In fact, the weather there has been pretty average for this time of year: Temperatures in the 20s F (around -5C) with some wind, a little snow and blowing snow lately. However, just a few days ago it was below zero on the North Slope and Bering Strait area. 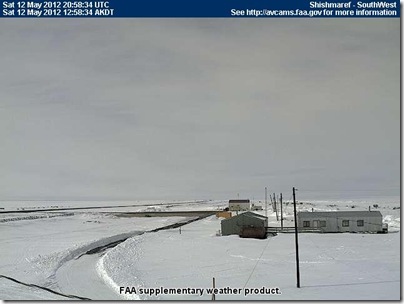 After a very snowy winter in Kotzebue, the 27 inches (69 cm) of snow on the ground is holding steady with well below freezing temperatures. The plows are still needed in Shishmaref. Click on the image to see it full size. 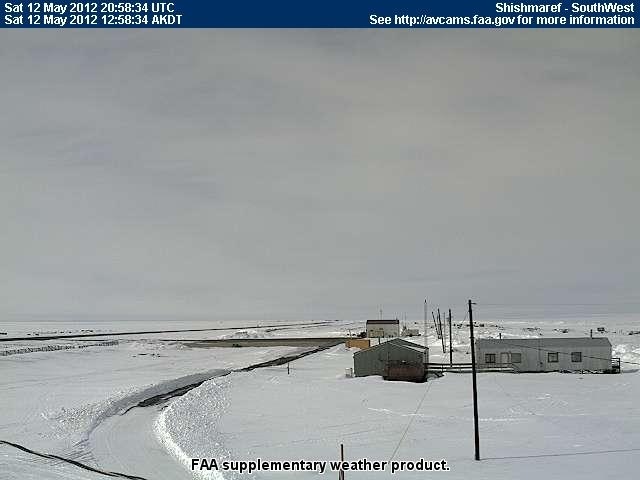 On the west coast, Alaska Peninsula and the Aleutian Islands winter is holding on very tightly. After a moderate April in Nome, temperatures are showing little if ay upward trend, running about 10 F degrees (5 C degrees) below average, with new snow over the last couple days. The Pribilof Islands have have also been about 10 degrees below average this month, with snow on 7 of 11 days so far, and 21 inches (53 cm) on the ground. Worse is the sea ice still surrounding them and its negative impact on area fisheries. The ice edge is way farther south than usual and, so far, not showing much inclination to retreat north for the summer. St. Paul has been in the pack ice for the longest period since regular record have been kept. 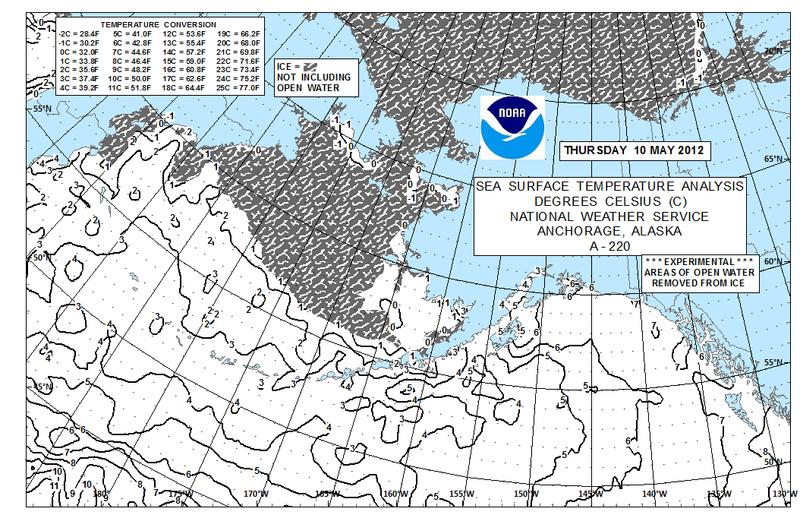 Along the AK Peninsula and Aleutians the mostly north winds have been picking up moisture off the ice-free southern Bering Sea and showering it on the volcanic arc in the form of rain and snow showers. At Cold Bay, snow has fallen every day so far this May, and fell 24 of 30 days in April. They have more than doubled their seasonal average, and have been climbing steadily in the Iditasnow standings. This recent sea surface temperature analysis also shows the ice edge in a general way. Look at the very cold water in the southern Bering and quite cold North Pacific: 5C down to around latitude 45N. This heat sink is not going to go away soon. The 500 mb maps shows a strong low near the Bering Strait streaming cold air out of the polar regions, over the Aleutians and and around the low into Southeast Alaska. This low is forecast to drop south then east and end up near Yakutat. Some relief from the cold is likely after this low dissipates next week. The interior usually heats up faster in spring than any part of the state due to its distance from moderating ocean influence. With a couple mountain ranges to block cool, moist marine air, the interior responds mostly to radiational effect, which are steadily going more positive with the lengthening days. The warm up is happening now after lingering winter cold in the first few days of May (down to 13 F (-11 C) at McGrath on the 2nd, and 8 (-13) at Bettles on the 3rd. Temperatures are close to average now, with Eagle’s high of 60 F (16 C) yesterday being the first such temperature for the interior since last summer, as far as I can tell. Spring is springing slower in Southcentral Alaska as well, but nothing too extreme. However, there is still 16 inches (41 cm) of snow in Valdez after the very heavy snow year for the whole region, especially coastal areas. Southeast Alaska is usually the warmest part of the state in early spring, until overtaken by the interior, and by mid-May has usually had more than its share of sunny, warmish days. Not this year. It’s been wet, cool and windy almost without exception. High temperatures (a better gauge than average temperatures in this case) have been running 5 to 10 degrees below average and precipitation 2 to 3 times average at most stations. Ketchikan has been soaked with around 11 inches (280 mm) of rain already in May, compared to 8.20 inches (208 mm) for the long term average for the whole month. At Skagway, 30-35 mph (50-55 km/hr) south winds paired with mid-40s (~7 C) temperatures are playing havoc with the early tourism business. A handful of cruise ships having already made it to the top of the Inside Passage, but at least one smaller vessel has altered its schedule to avoid bad days on the Lynn Canal blowhole, where 35 kt (65 km/hr) southerlies have been kicking up 7 foot (2 m) seas over the past 24 hours, and close to that on other days. 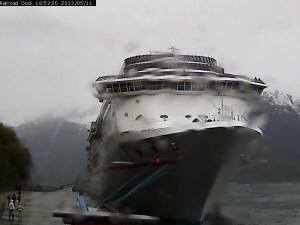 The Carnival Spirit docked at Skagway Friday, with little action on the dock. Note the webcam's rain splattered lens. Image used courtesy of White Pass & Yukon Route. Current webcam images here. This graphic from the Juneau Forecast Office shows an amazing temperature slide from a lone 60F (16C) degree day back in April to yesterday’s high of 41F (5C). Note that low temperatures have changed little, but daytime highs are what people are dealing with. About now this question tends to surface: Does the cold spring portend a cold summer? It looks like a significant warming is at hand mid to late in the coming week, but that says little about the rest of the summer, so check back for some info on this soon. How is spring progressing where you are? That info, or any questions or comments are welcome via the comments link below. 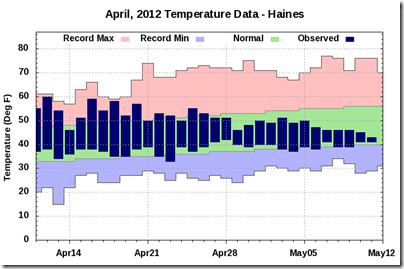 The winter of 2011-2012 — when will it go? Now I know why I am so cold when normally I would be lazing the May days away trolling for salmon! 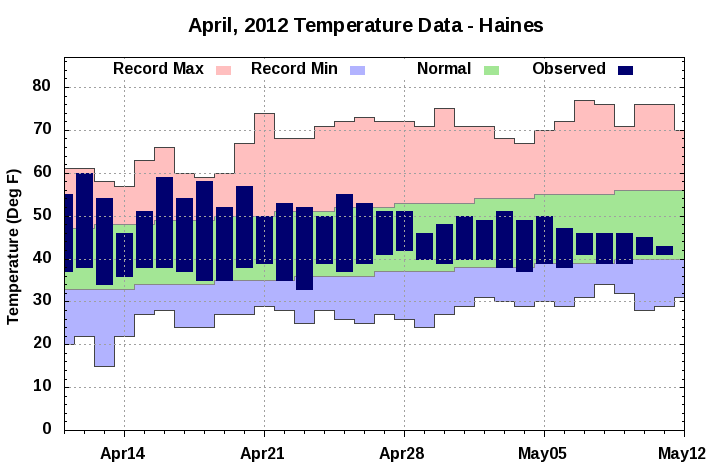 Here’s another curiosity: Fairbanks reported a high temperature of exactly 57 F on five consecutive days in late April! In fact between the 18th and 29th, the high was between 56 and 58 F on every day but one. Strange! Looking forward to your thoughts about the summer!